This is a project born of necessity. I needed a nice, large low nap rug for my guest room. I also wanted to spend less than $80 on it. After looking at all the local shops, online and Ikea I was left empty handed. The large rugs were either too expensive, too modern looking, or too cat-hair attracting. There were a couple of nice low nap rugs the right size, but they were all blank. Still, since I couldn’t find anything better I bought a plain blank rug and brought it home. First, I put it in the room. Then, I gave it a couple of days to “grow on me”. It was very, very plain. When it didn’t grow on me, I decided to do something drastic. 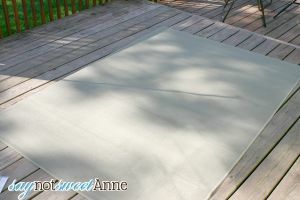 Since I couldn’t find a pretty, traditional, patterned large area rug- I would just paint the rug I bought! 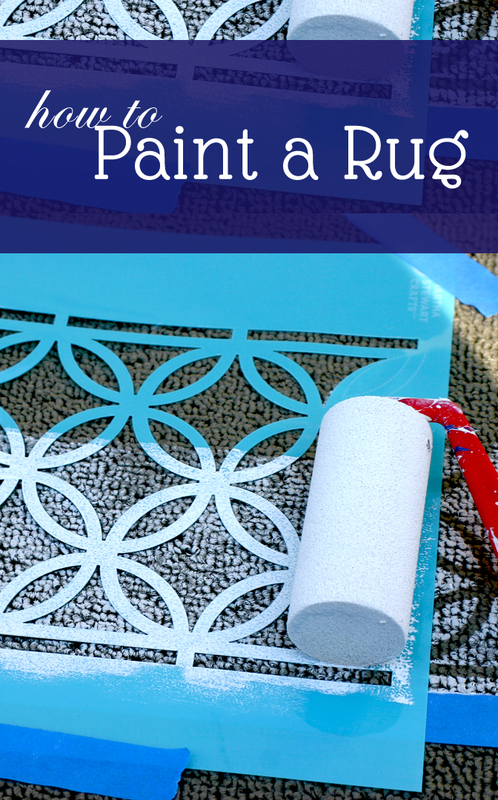 I did some research on how to paint a rug, but pretty much decided I needed to just dive in. So, armed with an amazing Martha Stewart stencil (this is the one I bought), a $5 foam roller and some left over ivory acrylic paint, I set to work. The results are better than I could have hoped for! The rug has that “pop” of something, and the pattern is one that I love. You can’t feel the paint on the rug (I imagine if it hadn’t been a low-nap rug your might get some stiffness). And the best part it the whole thing was only $20. So, what am I waiting for!? Lets get to it! 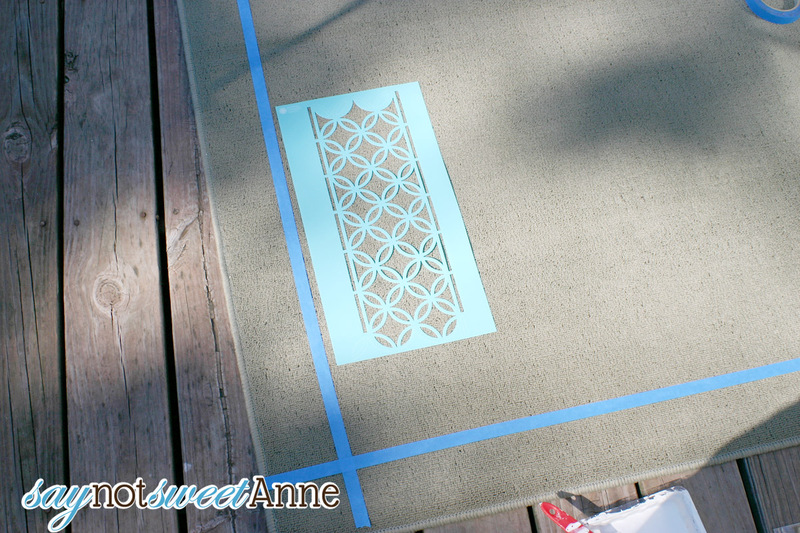 My first task was to measure and mark out the area I was stenciling. 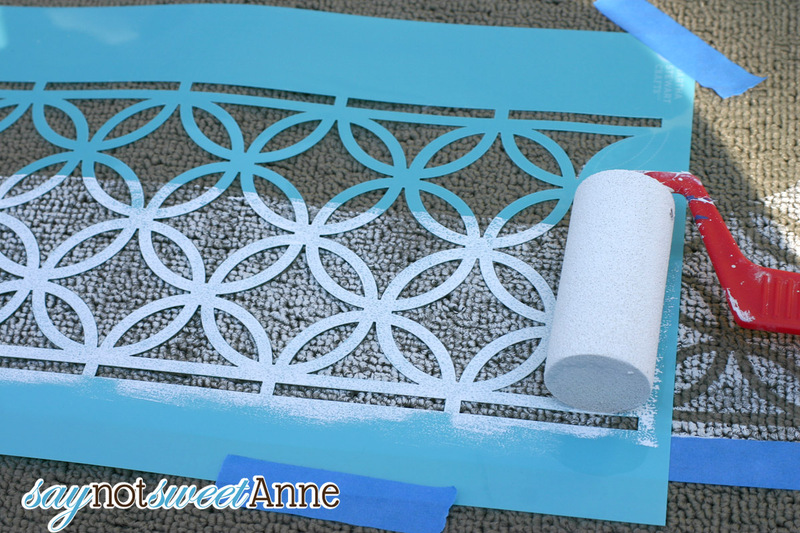 I used painter’s tape to make a line that I followed with the stencil. Place stencil and roll on. The stencil I got was amazing. It was meant to be repeated and has puzzle piece like parts to make sure I line it up when I start a new row. Plus, it came with a special corner piece which took all the guesswork out of going around the corners! Roll on the paint. Be careful not to be too heavy handed with it. Many rolls with a light coat is best. Try going from several different directions to get an even coverage. Wait for paint to dry at least 3 hours before walking on it. Done! 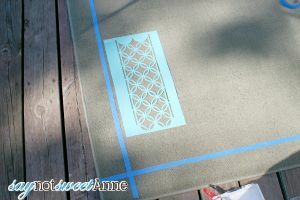 Even with the stencil, the taping, and the added bold line I made around my rug the whole project was done in 30 min. I wish I’d known figuring out how to paint a rug would be so easy. I wouldn’t have spent so much time looking!! Nicely done! I need to the same thing on my rug. This is so creative! Practical! Easy! I can do this! Wow! I know exactly where I am going to put this rug once I make it! Thanks for posting this great idea! [email protected] Kneaded Creations PS- I HAVE to add this to my Pin board! Where did you get the plain rug. I am having trouble finding a rug cheap enough to try painting on. I got that green rug from Wal-Mart for $15!! Have you tried washing it, or an experiment? I don’t typically wash rugs unless they need a spot treatment. I’m more of a beat-the-dust-out kinda gal. The rug did get some heavy traffic since its been down, and even with the bed leg scraping over it none of the paint has come off so far! What a neat trick! I’ve already pinned so I can try out one day! I LOVE how the rug turned out…and you can’t beat $20! It looks great, I’ll pin it to try it on my plain lounge rug. Can you use spray paint on these rugs? I wouldn’t. Spray paint absorbs more, and dries crustier than the acrylic. 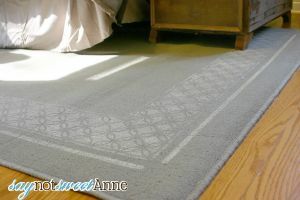 What does a painted rug feel like to walk on, is it soft like the rug? Its not bad at all! Since it is a low nap rug, its not exactly “soft” to begin with. Adding the paint didn’t make it noticeably stiffer on bare feet. You can tell a difference, however, if you feel it with your hands.